Playing in front of one of their biggest crowds this season, UCI got the win they desperately needed on Wednesday, January 9, as men’s basketball beat Hawaii 68-64. The game, nationally televised on ESPNU, was hotly hyped as part of the week’s homecoming celebration, with Antourage bringing out face painting and an assortment of giveaways to engage the crowd ahead of this Saturday’s homecoming game. 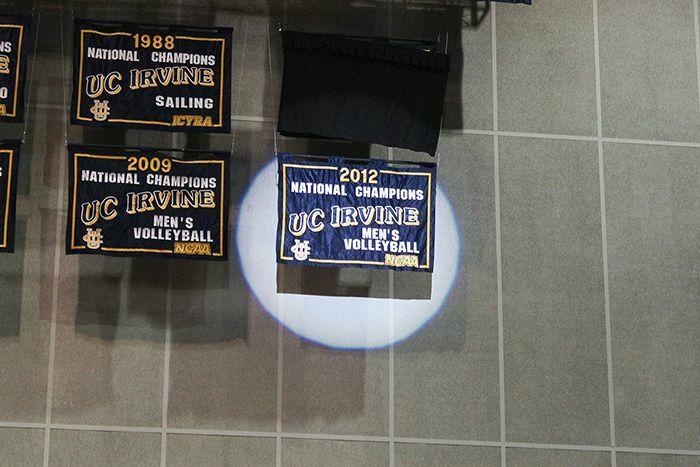 In addition, the men’s volleyball team was featured at halftime to honor their National Championship last season. Chris McNealy came off the bench to lead the team in scoring with 15 points and six boards to lead the offensive charge for the ’Eaters. “Today was a good performance, we struggled to close a little bit but we got the win,” freshman point guard Alex Young, who finished with 10 points and four assists, said. UCI got off to a sluggish start, stemming largely from turnovers and their struggles from behind the arc. Hawaii’s mix of man and zone compounded the ’Eaters’ problems, as holes in the defense were difficult to come by. Hawaii was threatening to run up the score late in the first half when Will Davis II, on what seemed to be an easy breakaway for Hawaii, ran down Brandon Spearman for a fantastic block, but drew a questionable foul. “That block, I just saw him breaking away and I knew I had a chance to catch him, I just caught a little bit too much of him I guess,” Davis said. Michael Wilder and Derick Flowers also made fantastic plays in the first half. ‘The Fro’ made a fantastic hustle play, scrambling for a steal and assist to Davis for an easy layup. Then, with eight minutes left, Flowers put his hops on display, as the high flyer had an acrobatic layup. Yet Hawaii seemed in control all half, and it could have gotten even worse when Young went down, grabbing his leg at the end of the first half. Luckily it wasn’t a serious injury, as he would return in the second half. “Just a little pull, but I’m fine. At the time it was tough to even walk on, but I came out [in the second half] and warmed it up a little and it’s good,” Young said. UCI’s subpar shooting half did not carry over to the second half, as the Anteaters came storming back. Young returned, and UCI switched to a 2-3 zone that thwarted Hawaii’s offense and gave the ’Eaters momentum. With about three minutes left, Young went up for an open dunk and, while it was key to UCI’s late rally, the dunk wasn’t exactly pretty, as he barely got up enough for the ball to rattle around before falling in. “I thought I could do it, but you know my leg hurt, so I went up and then went ‘Oh, maybe not.’ Just got enough so we’re good, you’ll see a clean one on Saturday though,” Young said. Anteaters afterwards welcomed Cal State Northridge into the Bren Events Center last Saturday in UCI’s homecoming game, where they went .500 in the league. Viewed through the scope of time, Wednesday’s game was just that: a game. What happened at halftime, however, was much greater than that for one UCI sport — it was a commencement, a coming-out party and a display of utter greatness. The UCI men’s volleyball team — reigning national champions — came out at halftime to display their NCAA trophy for all of Anteater faithful to bask in. Greeted by Chancellor Drake and of course Peter the Anteater, the squad lined up at midcourt to display the trophy and watch the unveiling of their championship banner, now proudly hung atop the Bren Events Center and immortalized in UCI lore. “It was an amazing feeling [being at half court], it took me back to last year when we were on the court, all the hard work we put in. The reception we got was amazing, and the fans are truly awesome,” Hughes said. Last Friday, the Bren Events Center had that championship feel, as USC came into town in a rematch of the National Championship game a year ago. “I’m really looking forward to the rematch, this will be a real test … our team is basically the same as last year’s, we only lost a couple guys and we have some new guys. It’s nice to have some fresh legs out there,” Hughes said about the then-upcoming game. 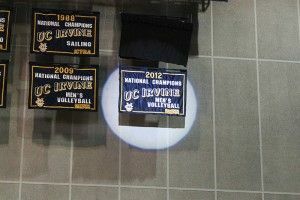 In addition, halftime was the unveiling of UCI’s homecoming nominations to the fans at the game. All of the nominees got to come to half court and greet the fans, building up the excitement in anticipation of Saturday’s homecoming game.